Instead of showering my largely imaginary fans with new posts over the past six months or so, I commenced preparations for the 2017 centenary of the Great October Socialist Revolution, aka the Original Twentieth-Century Holocaust. In doing so, I discovered two or three sportive anecdotes, one of which I hereby share with my so-called followers. Under normal circumstances, of course, vigorous outdoor excercise is supposed to be good for body and soul. Why else would one head for the mountains? Up there you invigorate your body and replenish your soul! Novelists, travel writers, philosophers and serious academics have extolled the virtues of non-athletic high-altitude camps from time immemorial. The Bolshevik exile, however, went on to wreak havoc on his native country soon after descending to sea level, and the sad outcome of his strivings is still tangible – not only in Russia. Besides, Lenin’s regime contributed to the spectacular rise of another mountain man, Adolf Hitler. The German totalitarianism can largely be perceived as a response to Soviet aggression and the supposed Judeo-Masonic conspiracy. True, Hitler never really took to skiing or hiking, but the Nazi leader’s mystical attachment to Berghof, his fortified retreat in the Bavarian Alps, is a well-known fact (which is why the Germans themselves got rid of the ruins in the 1950s). Did the two ideologues of intolerance and unlimited terror experience feelings of the sublime in the Alps? Did they ever manage to communicate with or at least sense the presence of their maker, as it were? Such feelings, I’ve been informed, are not rare among the high-altitude hiking community. 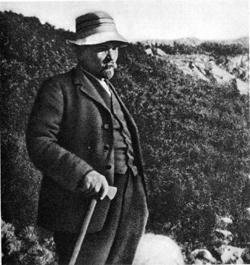 Instead of establishing contact with a supreme entity, Lenin and Hitler appear to have developed an acute sense of entitlement in the mountains. ‘It’s sheer delight, and it smells like Russia’, Lenin enthused in his letter to Inessa Armand. In fact, as a dedicated internationalist Lenin deeply despised ‘uncouth’ Russians and their ‘backward’ culture. What he experienced in the Alps seems to have been a vision of Russia devoid of disobedient people. If the enemy doesn’t surrender, just crush it! Small wonder so many athletes opt for the mountains in the build-up to a major contest – a contest in which the enemy is meant to be humiliated. Sport is, essentially, a Leninist endeavour: kto kogo? Who will overtake whom? Previous Post "The only time I touch a man is in the ring" – Sexuality, Masculinity and Boxing in Philadelphia Next Post Sofia Paldanius och "tävlingsdjävulen"